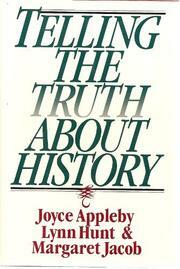  A ``late-twentieth century understanding of historical truth,'' outlined by three women historians, Appleby (History/UCLA), Hunt (History/UPenn) and Jacob (History/New School for Social Research). While there has been widespread discussion in the United States about the current state of academe, the supposed decline in its standards, and the prevalence of political correctness, there has not been much reflection, outside the profession, of what the authors call the ``ferocity of the current argument about how United States history should be taught.'' It is, the authors note, a controversy about values, objective knowledge, cultural diversity, and the nature of truth. The virtue of this book is that it makes a history of the study of history, particularly as it applies to the United States, more accessible to the general reader by turning a relatively dispassionate eye on the various schools of history that have prevailed: the protagonists of history as a science, the Frontier school, the Economic Interpretation School, the Marxists, the ``City on the Hill'' enthusiasts, the postmodernists, and the multiculturalists. The very prevalence of the different schools is, in itself, a caution against too heavy a reliance on any one of them, and the authors plump for ``the most objective possible explanations'' and the traditional narrative form of history. They believe passionately in the importance of what they are doing, in the ``intense craving for insight into what it is to be human,'' and reject those who are skeptical of the entire enterprise. The archives in Lyons, France, they note, are ``reached by walking up some three hundred stone steps. For the practical realists...the climb is worth the effort; the relativists would not bother.'' Underlying the argument, the authors contend, is ``the collapse on all fronts of intellectual and political absolutism,'' and they try to cut through the ``variety of noisy conversations'' with a more reasoned and less disputatious view. A tad tactful at times, and occasionally repetitive in noting the central role played by men in most historical accounts, but clearheaded, and often a pleasure to read.